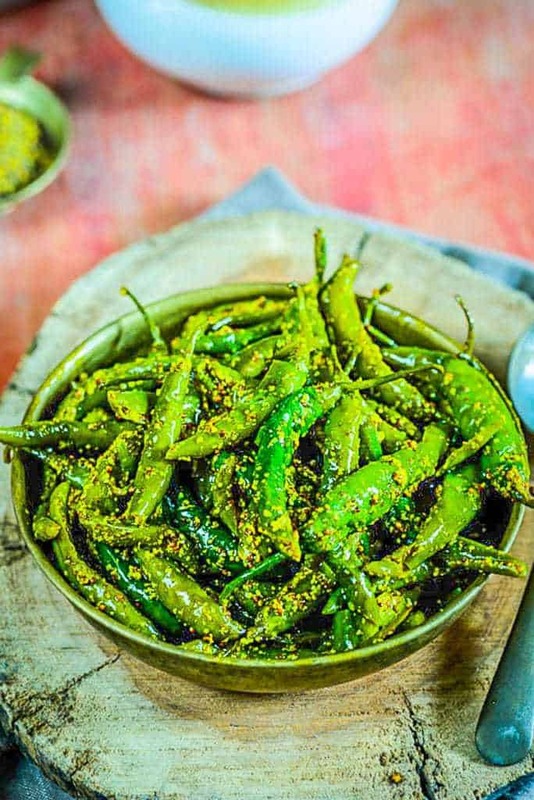 Hari Mirch Ka Achar or Green Chilli Pickle is a delicious North Indian style pickle recipe where fresh green chillies are pickled with mustard seeds and lemon juice. This pickle goes very well with any Indian meals. Here is my mother’s recipe of how to make green chilli pickle or hari mirch ka achar. Be it summer or winter or monsoon, we love having a jar of pickle, ready to be savoured! Unlike mangoes which are explicitly available only during summer, there are some achar or pickles like Gajar, Gobhi Aur Shalgam Ka Achar that you can make anytime you want! But out of all, I like nibbling on Hari Mirch Ka Achar Recipe or Green Chilli Pickle Recipe the most! Green Chilli Pickle Recipe is made using fresh, green chillies, mustard seeds, mustard oil and salt. In order to make it slightly tangy and colourful, lemon juice and turmeric powder are added to it respectively. These days, ready-made pickles are easily available in markets and superstores. However, I often have doubts about the quality of ingredients used by manufacturers. Also, when pickles are made for commercial purposes, I believe somewhere down the line, that personal touch goes away. Homemade pickles taste way better as we walk extra miles to ensure that the best ingredients are used and the process remains hygienic. This hari mirch or green chilli achar recipe is great to add just the right amount of spice to your meal. It’s also a great way of adding some oomph as the divine spice of the green chillies get masked with the flavored of the pickle. If you’re one who likes to have a touch of spice in the form of pickled goodness with your meal or if you are regularly reaching out for those achars, then this Rajasthani hari ka mirch ka achar recipe is a must try. Therefore, I suggest, buy some fresh, green chillies and prepare this finger-licking Hari Mirch Ka Achar Recipe. Store this pickle in a clean jar, keep it near sunlight, shake it well and it is going to remain fresh for more than three months. Savour it with piping hot Pudina Laccha Parathas or relish it with rice, curries; Hari Mirch Ka Achar Recipe is surely going to tickle your taste buds. 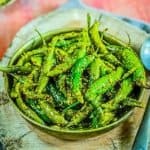 Just quickly bookmark the recipe for Hari Mirch Ka Achar Recipe or Green Chilli Pickle Recipe and follow me on Facebook, Twitter, and Instagram to learn more interesting recipes back to back! Hari Mirch Ka Achar Recipe or Green Chilli Pickle Recipe goes very well with Indian meals. Here is my mother's recipe to make this pickle. Wash the chilies and wipe them using a cotton cloth. Make a slit in the center of each chilli using a knife. Grind mustard seeds in a blender to make a coarse powder. Mix ground mustard seeds, salt, turmeric powder and 1/2 cup mustard oil in a bowl. Fill this masala in the slit of the chilies and arrange the chilies in a large bowl. Add lemon juice in the bowl and mix well with chilies. Cover the bowl with a cotton cloth. Leave the pickle in the bowl for 2-3 days so that the excess water evaporates. Fill the pickle in clean glass jars. Heat 1/2 cup mustard oil in a pan till it starts to fume. Pour the oil in the jar so that the pickle is covered with oil. The pickle is now ready to use. This pickle can be stored for 3-4 months in a cool and dry place. Keep the jar in sunlight every 30 days and keep shaking the pickle after every 30 days. Please what kind of chili can you use that is not so spicy? Any green chilli is fine for this recipe. What oil can be used other than mustard oil? You ca use vegetable oil or even olive oil but Mustard Oil is traditionally used in Indian pickles and it gives a peculiar flavour to the pickles. Thank You for the recipe. I made the pickle but didn’t keep it in the bowl for a few days. Will definitely do it this time, so that it will last longer. Thanks for the sunlight tip as well. Also, can I decrease the amount of oil in the pickle? We use sesame oil in south india for pickles. Can i use sesame oil in this recipe too? You can use, but the taste will be quite different.